Posted by Jon in Review, Takara, Transformers with 1 comment. My fingers are in serious pain as I type this. Takara’s MP-36 Masterpiece Megatron easily has one of the most complex and, at times, frustrating transformations of any Masterpiece I’ve owned (after MP-10, anyway, since I never had the original MP-05 Megatron). I spent a good hour getting him into his gun mode the first time. I even needed a break after completing his top half , so I left him sit unknowing that when I got back I was going to run into some of the tightest hip joints EVER. Oh boy! Even after I got the hips sorted out, tabbing those last parts of the gun together was quite the exercise in trial and error. It still doesn’t feel quite perfect, but it’s good enough for me. Shortly after typing that first paragraph, Megatron went back into robot mode and he’s likely to stay that way for a good while. Credit where it’s due, Takara went for it. They made a Masterpiece-scaled Megatron in bot mode that doubles as a cosplay accessory when transformed. The size works in both modes! Obviously he’s not going to transform into a gun that Starscream can hold with one hand because that would be physically impossible. Takara found a way to finally make those legs look attractive, or dare I say seductive, in robot mode. Yet they all fold in and turn into the gun handle in his alt-mode. It’s quite a magical process! I don’t hold the overly complicated transformation against him. It certainly isn’t indicative of the MP line as a whole. In fact some of the most fun and inventive transformations can be found in characters like Ultra Magnus or Inferno. Megatron was never going to be easy. Turning an in-scale robot into a believable gun that a human can hold is no simple feat. In the last year we’ve seen a few examples of third-party companies taking a stab at improving the Megatron formula. All of them were complicated, and all of them have been put to shame by the official one. In 2011 Transformer fans were blessed with the just about perfect version of Optimus Prime when MP-10 was released. Fast forward six years, twenty-six official numbered Masterpiece releases, a whole mess of variants, and we finally have the other bookend with Megatron. I still don’t have a properly colored Optimus Prime, just the “Year of the Horse” variant that is pimped out in gold chrome and a clear trailer. Maybe one day I’ll correct that, but for now I have a Prime and that’s good enough for me. Megatron comes packed in his robot form (just imagine the nightmare of trying to get these into the US in gun form?) with a whole mess of accessories. He comes with the stock, scope, and silencer for his gun-mode. In addition to that he also includes a blaster, laser dagger, energy mace with two different chains, the key to Vector Sigma, his headset (for when he’s playing Counterstrike), three extra faces, and a damaged chest part. Megatron’s scope/arm cannon comes with voices and sound effects depending on which way you position the switch. He has three modes: yell at you in Japanese mode, blasters noises, and transforming sounds. The weapon takes two LV44 sized batteries. I’m not sure if it’s a widespread issue, but on my figure the batteries were unable to stay snug in the chamber so the gun’s sound effects wouldn’t work. I found that putting a little padding under the hood, such as a small part of a napkin or piece of paper did the trick! The voice work is great, and I prefer he yell at me in Japanese. That was one of my favorite parts of the recent Titans Return Fort Max. Being the best doesn’t mean he’s free of problems. Besides being downright scary at times to transform there are a few things to watch out for. Considering he’s covered in a fresh coat of gray paint you should expect some chipping or rub on the parts that get a lot of handling. If you plan to put the silencer on him in gun mode, don’t push it in too far up the barrel or it could chip the paint away as well. I know that some people get very upset about paint wear, but it doesn’t bug me too much with Transformers. I’d imagine a real-life Transformer would likely have the same issue, so in a way paint rub could be considered a feature! Maybe that’s going a bit far. However, while it’s not ideal, it also isn’t the end of the world. I can also completely see how breakage can happen. Getting those hips to budge into their gun mode position isn’t easy. There also aren’t many good places to get a good grip on him. I had to back off a few times because it felt like I was stressing the joint that attaches to the leg to the hip too much. I’ve heard if you loosen the screw in his hip a little it will make this process easier, I haven’t done it yet to confirm. Also be gentle with the gun’s barrel. It’s held there with a little rod of plastic, and I’ve seen pictures of them snapped off. Set aside an hour or so to transform Megatron, at least the first time through. Don’t rush it and risk breaking this amazing toy. 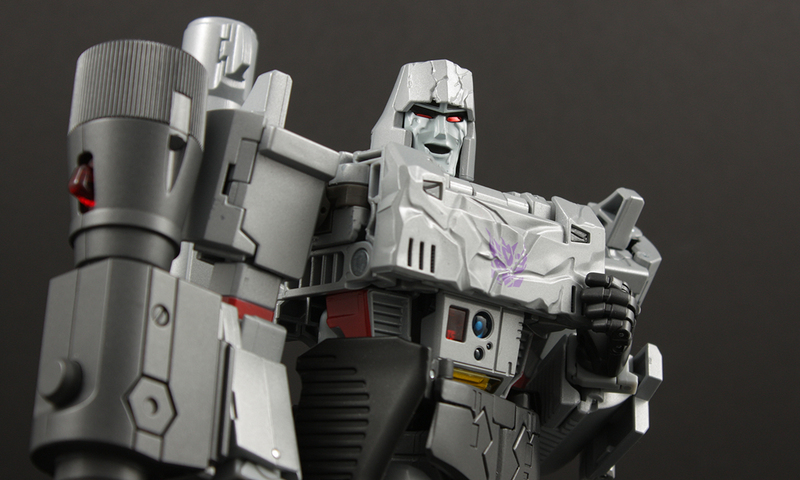 So should you get yourself MP-36 Megatron? If you are a Masterpiece collector I can’t see how you could pass on this. Yes, he’s pricey. Yes, his transformation is a bit involved. However, he’s the leader of the the Decepticons and MP-05 is not an acceptable substitute. Honestly, the transformation isn’t really that bad the second time around (yes, I said I wouldn’t but I went ahead and transformed him again while writing drafts of this review). Those hips are really the only scary part, and by the time I went back and did it again I had a much better feel for them. Megatron looks great and has so many damn options to mess around with. I think Takara hit a home run here, I can’t wait to see what comes next. Grab MP-36 Megatron on Amazon! Agree 100%. I’ve been making it a point to transform him once a day to get familiar with the areas that need gentle force and areas that need elbow grease. He’s just amazing. I also love your point about the paint chipping. It doesn’t bug me either and adds a touch of “realism” so to speak for the character. Though if Takara makes another wave with the issues fixed, I’d be tempted to pick up another for a minty-fresh version.